There's never been a better time to buy a drone. That's because drones are housing top-notch 4K cameras and sporting portable form factors. That is, many of the best drones these days fold up for easy transport, so you can take them wherever you're next adventure is headed. Super-steady video stabilization is also a hallmark of a great drone, and you'll find this available in just about every drone model out there. You don't have to be an expert drone operator to get started with a high-quality drone. Most drones are easy to pick up and start flying, though selecting the best drone is still a difficult task. We've recommended the following top drones after countless hours of rigorous testing high above our heads. Drones by DJI and Parrot continue to rule the skies, whether you're a first-time flier or a drone pilot expert looking for the ultimate hovering camera. The best part of picking from the best drones in 2019 is that affordable or even cheap drones now shoot 4K resolution video with steady image stabilization. It's true; you don't need a Hollywood blockbuster budget to capture amazing aerial footage. Even if our No. 1 drone recommendation, the DJI Mavic Air, isn't exactly inexpensive, it's still the best drone for your money. Finding a quality drone at a reasonable price isn't hard anymore. Being able to fly your drone legally is sometimes more tricky, especially in cities. The good news is that the best drones available give you fair warning – usually through accompanying apps – that map out where it's legal to fly without incurring the wrath of local authorities. Here are our picks of the best drones for everyone, from beginners to experts. It's hard not to absolutely love the DJI Mavic Air, the premier foldable drone that can capture steady 4K video at 60 frames per second, yet fit into a backpack or even a jacket pocket. There aren't many compromises either if you're okay with 21-minute battery life. Our tests proves its true flight time can be as little as 18 minutes, but that's enough time for most people, especially if you buy into the recommended Fly More Bundle with three batteries (totally worth it). The Mavic Air is small, fast and can do a lot of neat tricks. It can track moving subjects, boomerang around them on a pre-coordinated path, and take spherical video as if it's crashing down to earth to capture your ultimate drone selfie. The reason this tops our list is that it's the best foldable drone for you money, but we do encourage spending a bit more for the totally worth it Fly More Bundle. The second iteration of DJI's Mavic Pro delivers the sharpest videos and stills of any consumer drone thanks to its gimbal-stabilized Hasselblad camera, which boasts a one-inch CMOS sensor. Pictures are brighter, more detailed, and noticeably superior to those taken using the previous model. This comes at a price - the Mavic 2 Pro is a pricier proposition than the previous iteration - but it might become much more tempting on Black Friday. Many retailers offer special deals on premium drones, and the Mavic 2 Pro may be among them. The DJI Spark is the company's most approachable drone. With its incredibly cool gesture controls that make you feel like a Jedi and its different colored body shells, it's definitely more fun out of the box than a lot of the others on this list. It is easily controlled using your smartphone, but it's worth noting that that's the only controller you're going to have unless you fancy buying a separate controller. It's definitely affordable in terms of drones, but still we would like to have a controller thrown in for good measure. It's an incredibly light drone, unsurprisingly as it's the size of a can. This is both one of its greatest strengths and its greatest weaknesses as it's super easy to carry around in your bag, but will be affected by wind during flight. A refinement of the already impressive DJI Phantom 3 Professional, the Phantom 4 brings with it a more sturdy construction, updated object-avoidance technology and – like so many of DJI's offerings – an excellent dedicated remote control which connects to an equally feature-rich smartphone app. 4K video recording is supported, and the gimbal design means you get rock-steady footage even when the drone is moving at speed and changing direction. The biggest downer – and you'll notice this is a common complaint with many commercial drones – is battery life, which is only around 15 to 20 minutes, depending on how hard you're pushing the drone. While it's not quite in the same league as its Inspire 1 sibling, the Phantom 4 offers a similar degree of performance and functionality for a lower price, making it an excellent option for budding aerial photographers rather than experienced professionals. The Bebop 2 is a mid-range offering which won't break the bank yet offers a surprising amount of features for the price. The camera utilises a fisheye lens, and stabilization software removes the need for a gimbal; combined with the intelligent construction of the chassis, which uses rubber dampeners to reduce vibration in-flight, this results in video footage that's refreshingly judder-free. If you're feeling especially flush you can take the Bebop 2 to the next level by purchasing the optional flight controller and FPV headset. 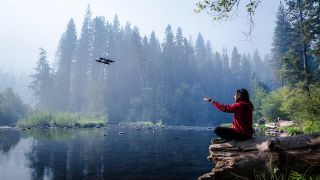 The former connects to your smartphone and offers proper flight controls, while the latter uses your phone's screen to present a first-person view of what the Bebop 2 is actually seeing. It's initially quite jarring to fly the device in this fashion, but after a while you'll wish all drones came with such an accessory. On the downside, Parrot has locked away some of the Bebop 2's more interesting features, such as route planning and 'follow me' functionality, behind a paywall, which means the cost increases further if you want to use these. Battery life is also somewhat disappointing, so it may be worth investing in a spare power cell. This lightweight, bug-like drone might be small, but its photography chops are among the most impressive around. Its camera has 180 degrees of vertical range, which enables it to take photos directly upwards - a feat no other drone can match. It also has a 2.8x zoomable lens with no image quality reduction. The Parrot Anafi is a particularly good choice for selfie fans. Its Follow Me mode tracks your movements, adjusting automatically for more photogenic angles, and its SmartDronies modes - Orbit, Parabola, Boomerang and Tornado - cause the drone to fly around you in various circles and arcs. The main drawback is the Parrot Anafi's lack of obstacle avoidance, which makes it hard to recommend to new users. It's also a shame that a couple of flight modes are locked away as extra in-app purchases after you've paid for the drone. It's now been superseded by the DJI Mavic 2 Pro, but this is still one of the best consumer drones around - and now it's more affordable too. Until the DJI Spark came along, the Mavic Pro was the smallest drone in DJI's lineup. Don't let its diminutive size fool you though – this pint-sized flyer boasts the kind of performance that DJI's larger drones are famous for. The camera is mounted on a gimbal, which is unusual for drones of this size. It delivers fantastic results with both photos and video in good lighting, although the small size of the sensor means low-light shooting can sometimes be tricky. The Mavic Pro has a top speed of around 40 mph, so it's no slouch in that department, and the battery is good for around 20 to 25 minutes of aerial action. As is the case with other DJI drones, the Mavic Pro comes with a dedicated remote control that uses your phone's display to show you exactly what the device is seeing. Range is quoted as being over four miles, giving you the opportunity to capture some amazing stills and video without worrying about the connection dropping. Soundly knocking its predecessor off the top spot is the highly impressive Inspire 2. With a sleek metal composite bodywork upgrade, it's a much more attractive piece of kit. What's more, with more advanced object avoidance technology you don't have to worry about that beautiful body getting scratched by you accidentally clipping a tree. You get more than 25 minutes of flight time out of the twin-battery arrangement, and the ability to swap camera lenses means that professional photographers and videographers have complete control over their images and 5K video. The fully-featured smartphone app and dedicated remote control make this drone incredibly easy to control, but make no mistake, this is a professional piece of kit. The DJI Inspire 1 may look like some kind of fearsome war-robot from the far future, but once you've gotten over its rather intimidating appearance it's all too easy to fall in love with this agile and feature-rich device. It comes with its own controller, which boasts amazing range (you'll need to supply a monitor via your smartphone or tablet's screen, though), and the camera – which is mounted on a gimbal for aiming – is upgradeable, so you don't need to worry about your investment becoming obsolete after a few months. Performance in the air is nothing short of exemplary, even in quite windy conditions. The DJI Inspire 1 is also incredibly swift and – when twinned with that excellent controller – easy to maneuver. It's only shortcomings are its cost and the fact that the bundled battery only gives you around 15 to 20 minutes of flight time before it needs recharging. This is the smallest drone featured in this list, and also one of the cheapest. Despite its humble status (and rather odd name) the Dobby is a surprisingly powerful and versatile piece of kit. Pitched by ZeroTech as a 'selfie drone', it's small enough to fit in your bag, which gives it an advantage over many drones, which are often too large to be carried around easily. The small size of the Dobby means it gets battered around in strong winds, but on a good day its performance is impressive. It's controlled via a smartphone application and features such as orbital moves, object tracking and facial recognition are all included as standard, and are easy to execute. The drone's audio and visual sensors, fixed on its underside, mean you can perform palm take-offs and landings, and you can use it indoors.